As writers, we all know the wise writing quotes about “fear”. Fear of failure. This part week I’ve experienced quite a lot of it myself. In the ebook, Indiestructible (highly recommended) Anne R. Allen puts a particularly feminine slant on this, with the acknowledgement of a bag lady syndrome. I brought out my first edition of my newsletter late Friday night my time (to be fair, it had taken me all day to design). Learning opp: newsletters on weekends = no response. I’ve been saddened in a couple of online courses where we are asked to supply our platform stats (twitter, Facebook, blog followers, that kind of thing) – that world of compare is easily a good origin for fear that I am doing so much wrong while everyone else seems so much better at [fill in anything here]. My big smart move to have my daughter and friends record a witty humorous farcical but very cool* book trailer was scarpered on the day of recording. Despite a brilliant script supplied by myself, and much prop making, research and script read-throughs, technology let us down on the day and I’ve got a fuzzy video of miming – no audio. Back to the drawing board, total let-down. * Apparently – according to my daughter’s friends it’s not cool to use the word “cool” anymore because it stands for “crusty old only lady”. Anyone at school who uses the word is immediately giggled at for being an old lady. While we discussed how judgmental and bullyish this all is (remembering that my daughter’s peers are all Tweens testing out their limits for rudeness and what society deems acceptable), it reminded me, dare I admit it, of bag ladies again. My failures of this week have brought about my own inner bag lady. Her existence began as soon as I left full-time work and was no longer making my own money. There is an amount of guilt over being at home, not earning money for the family. That fear means that my motivation for writing is defined by something it shouldn’t be – the need to make money to ratify the time spent on all of this. There’s all kinds of advice on what motivations truly work for writers. Some of it is contained in the sharings from other writers in Indiestructible – not just for Indie or Self-Published writers. Anne R Allen used the bag lady theme for her first book. I have always wanted to be this old cranky woman (with purple hair, wearing red, perhaps with cats) when hitting an older age. Of course, bad ladies and street people sadly come from all age brackets nowadays, and for many different reasons. So I guess I should embrace that lady inside of me right now. She’s telling me things. This post took part in the monthly Insecure Writer’s Support Group – which is currently still running from Alex Cavanaugh’s blog, but will soon have it’s own dedicated website. At the link above you will find many other writers worth reading on the subject of how we get over our various writing insecurities. Excellent post! 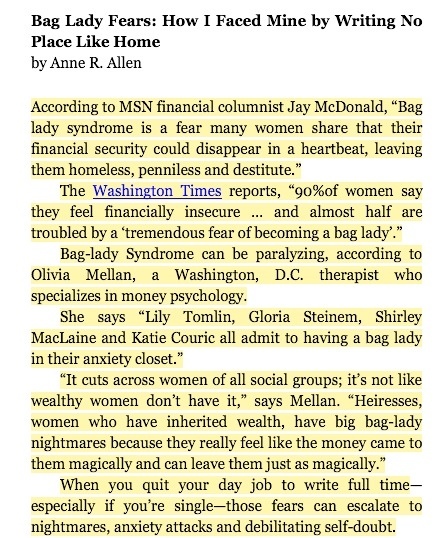 I’ve had my own bag lady insecurities recently and can relate. Thank you for your honesty. Maybe for the guys call it, “Guy under the bridge syndrome.” I do understand where you were coming from in this post. Money is ok for a motivator if its only part of the equation. There should be other things along with it. This is true of those who work at a job too. That’s why there is so much burnout in the workplace. Cool =Crusty old only lady = doesn’t even make sense. What word are you supposed to use instead? I’ll have to ask my ten year old what is deemed acceptable instead of cool.